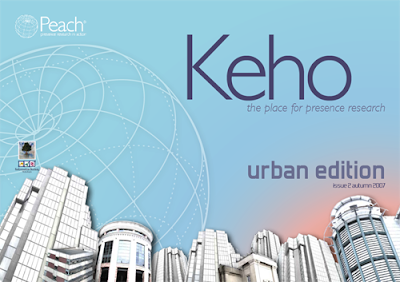 ,Keho is a e-zine produced at the Centre for Interaction Design, Napier University, Edinburgh, UK with the aim of stimulating debate and discussion about Presence research, its future direction and its impact on society. Published twice a year, and aimed at the wider presence research community the e-zine is really rather nice. The articles are well written with a style that almost makes you wish it was in print. Of note is the urban edition containing, amongst others, articles on mixed reality and electronic devices as design exploration, its well worth a read.